Ms. Da Costs promises to demystify the complex contact center business of finding the right company to partner with for sales and marketing lead generation/qualification/sales programs. 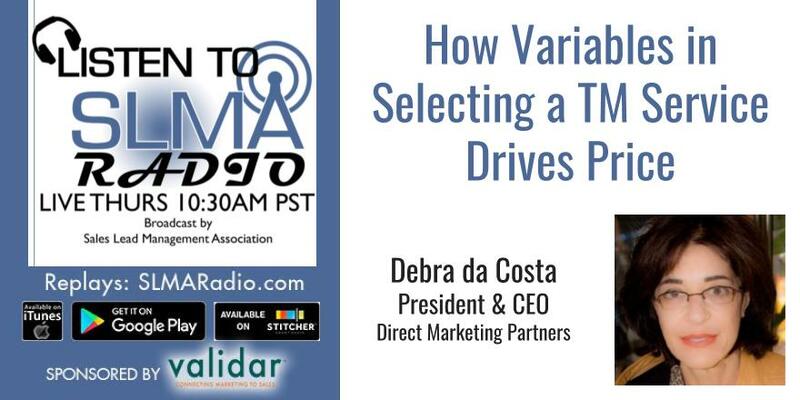 Debra da Costa founded Direct Marketing Partners in 1991 with the goal of creating a company truly responsive to the individual needs of clients. To this end, she structured DMP so that the company would be large enough to have the depth of expertise required by corporations with worldwide interests, but of a size that would permit close project participation by all the firm's senior staff, as well as flexibility and agility. In her career, Debra has held several design and technical positions with public agencies in both Canada and the U.S. and was responsible for the marketing efforts of Lawrence Moss and Associates. Before creating DMP, Debra was the President of Debra da Costa Consulting, where she was responsible for high-tech industry marketing campaigns. A native of Los Angeles, Debra holds a B.S. and M.L.A. from University of California, Berkeley. For more than 20 years, DMP has blended the human touch with marketing automation and sophisticated analytics to help its clients go to market and connect with their target audience. Their embedded call center is the hub of its marketing wheel, as B2B telemarketing converts more prospects to sales-ready leads over any other communication vehicle. Email, webinars and seminars all have their place and deliver those services, but NOTHING captures information better than a one-on-one conversation. DMP's U.S. based workforce is experienced in selling hard-to-explain, high-priced products. Reps are thoroughly trained in each client's business model and product or service. They speak from knowledge, not from a canned script. DMP serves B2B companies that have complex sales processes, typically in the technology, healthcare or public sector industries. They fill pipelines with BANT-quality leads to client specifications. The company augments its clients' in-house and channel sales teams with the full scope of lead generation services. Plus, DMP can also solve problems such as poor conversion rates by reverse-engineering the sales process to find out what's working and what isn't. DMP's recommendations are analytics-driven and our reports and dashboards add value to data by bringing transparency to sales pipelines and identifying areas of crisis and opportunity that demand immediate action. Susan Finch and Jim Obermayer were joined by Trish Bertuzzi, President & Chief Strategist of The Bridge Group, Inc.
How are they using Twitter? The post, "Twitter for Sales Reps: Big Hat - No Cattle" is about engagement. Twitter is a GREAT tool for listening. But, when you tweet, it's a snapshot - like a lightbulb going off in a room. If no one is in the room, no one sees your flash. Read the research in the post. Trish summed up that she could get better true engagement through LinkedIn, email, cold calling people. Testing big companies - same results. The question is, do you want to be POPULAR or do you want to be RICH? There are other ways to get people engaged with you that will give you a higher. She continued with, "Only so many selling hours in a day. Before you assume Twitter will work, do your analysis. It may be only a listening tool for you. We are not really reaching out to people through Twitter with rare exception. Twitter is a spam cannon when you think about it.If you are not following me, I can't have a one on one conversation with you. But on Linked In, I can send you an inmessage, I can contact you through a shared group. That's the key point. It's not one on one with Twitter." Spam may be too harsh a word, but perhaps not. "I even schedule my 5 tweets a day. Unless you are in the room when my scheduled tweet or your scheduled tweet goes out - we will miss each other's messages." "I have a ball with those 142 characters!" The second half of the show Jim Obermayer and Trish talked about the increased effectiveness of outbound calling. Outbound prospecting has improved dramatically - up by 35% Prospects are picking up the phones again. It isn't all about inbound, although inbound IS THE BOMB! Referrals - absolutely the way to go. But if you are like most companies, you'll get 40-60% from inbound. Unless 40-60% of quota is good enough, you need to get on the outbound prospecting path. You have to have direct dial numbers to be effective. People are actually hiring staff to populate the database before it gets to the caller: name, title, direct number and email. Truly raising the positive results. Connect and Sell provides 5-6 conversations per hour for most of her team. For her, 8-11. That's HUGE. The other technology she loves is Insidesales.com. Use their dialer technology combined with local presence. For every call you make you show up as a local caller to the number. Aren't you more apt to pick up the phone from an unknown local number? Jim asked her why it's working better, "I think we're getting better at understanding cadence and telling a story. It takes 7-8 touches to get someone to respond. Those touches have to be in a fairly short period of time. Success comes from using a variety of mediums: video, email, voicemail. Cadence counts and you need to figure out what your cadence should be. We've also gotten better at telling story via our touches. These are chapters in your story that you are trying to tell your potential buyer." There seem to be two basic camps. Jim talked about increased success for one particular company using this approach: Send email, then call 20 minutes later - success rate went up, call back rate went up. Trish disagrees with this method - not a fan of the double tap. Best for desk-bound targets. Not a great platitude. We could have two companies using the doubletap: great branding and recognition - works better; lesser known companies, doesn't work as well. Jim asked about the misinterpreted and repeated stats from SiriusDecisions: "59% have already made up their minds..." Trish let SeriusDecisions off the hook. This was misquoted and twisted. "It's like the game telephone, the more accurate quote is that '59% start their research online'." Listen to the show to hear the full story. Over the last two decades, Trish has promoted Inside Sales as a community, profession and engine for revenue growth. In the process, The Bridge Group has worked with over 220 B2B technology clients to build, expand and optimize their inside sales efforts. By a combination of hard work and timing, Trish and team's research & ideas have been featured on Inc.com, by associations like SLMA & AA-ISP and across more than 68 sites in the sales and marketing blogosphere. 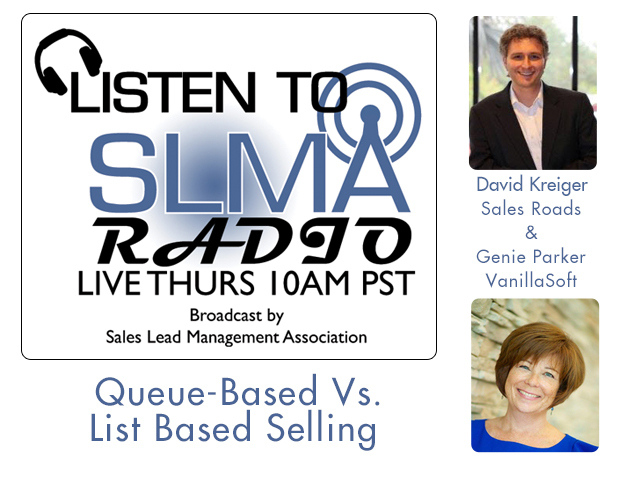 SLMA Radio host Jim Obermayer asks Mari Anne Vanella to tackle the tough subject of navigating what should be paid for the different levels of telemarketing services. Mari Anne is the president of the Vanella Group and is a featured speaker at the annual SalesForce.com Dreamforce meeting. In this 40 minute interview Obermayer will work with Mari Anne to separate fact from fiction about telemarketing pricing and the different levels of compensation based on the project scope. Should database clean-up be different from lead generation which could be different from appointment setting, which could be different from pure sales, which is different from lead nurturing? What about a flat hourly fee verses those companies that charge for per calling hour, management and reporting? Her executive leadership roles in enterprise technology sales organizations with field reps, sales engineers and customer service teams contribute to in-depth knowledge and hands-on experience which results in a solution that has unmatched results. Her industry affiliations include being a Founding Member of Women In Technology International's (WITI) Global Executive Network and sat on the panel of Technology Influencers at the WITI Summit alongside the CIO from Cummins and VP from IBM. 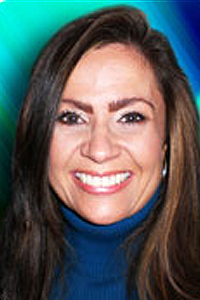 She is also a speaker for The Direct Marketing Association (DMA) of Northern California. 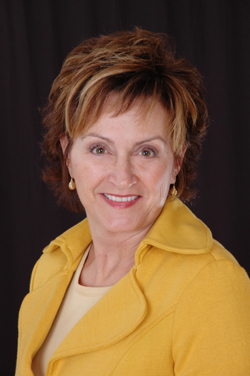 She is an honorary sales professional in the Sales & Marketing Executives International (SMEI.) Mari Anne has also been active in The American Marketing Association, the Silicon Valley AMA, SVASE (Silicon Valley Association of Startup Entrepreneurs), Women in Consulting, National Association of Female Executives, and the Sales Lead Management Association. She was nominated for the Industry 50 Most Influential People in Sales Lead Management in 2010,2011, 2012 and listed in the "20 Women to Watch in Lead Management" in 2011, 2012, and 2013. She is consistently ranked in the top industry influencers on Kred. Recently she has authored the best-selling and award-winning book 42 Rules of Cold Calling Executives which is available on Amazon.com and other retail channels. Mari Anne's graduate studies in Business Management were through the Edinburgh School of Business, Heriot-Watt University.